New Year's Glass - half full or half empty? It’s that time of year when we look back to what we have achieved, and forward to what we might achieve… if we put our backs into it, if we don’t pause to worry that we’ve chosen the wrong career path, the wrong genre, the wrong character, the wrong viewpoint, the wrong word. I’ve come to realise that whether my glass is half full or half empty, I have a tendency to spend too much time holding it to the light to check instead of relaxing into the moment and luxuriating in the taste. Most novelists tend to be introspective souls, better at redrafting on paper than leading others enthusiastically into the great unknown, and for us it’s only a matter of degrees to focus on what we’ve failed to achieve on our ever-expanding To Do list rather than what we have achieved. So let’s take a moment, you and I, to raise a glass to our achievements this year, because each has been a step towards a fruitful and fulfilling 2018. Salute your achievements ALL Year! I've decided to let this become a tradition, because, as with all good Traditions, it has the right amount of fact while not taking itself too seriously. The article was written by me for Christmas 2016, but remains an evergreen to raise a smile, and snippets can be retold over a glass of something warming and yet another mince pie. Which finally brings me to NORAD. Yes, I do mean the North American Aerospace Defence Command based in Colorado Springs. In 1955 Sears Roebuck & Company, also based in Colorado Springs, placed an advertisement in the press inviting children to phone Santa. Except the phone number was misprinted. Guess who was inundated with phone calls? CONAD – the Continental Air Defence Command and forerunner of NORAD. 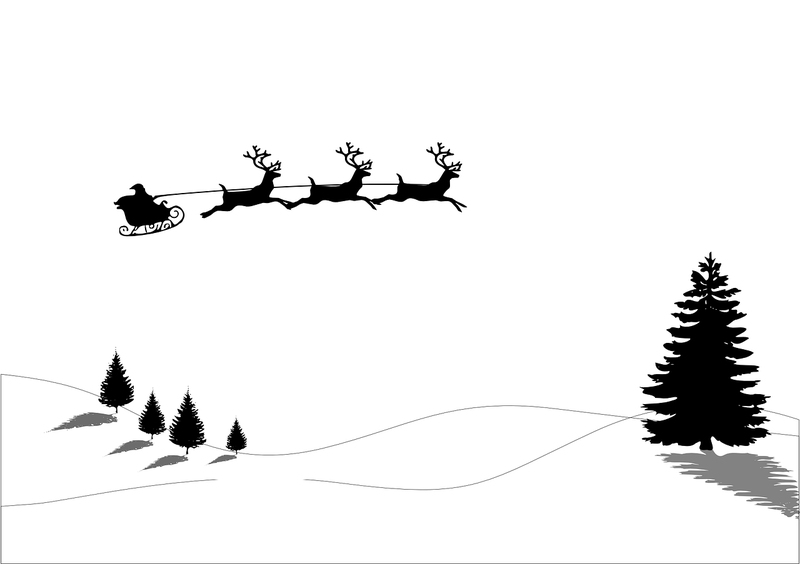 Despite being in the grips of the Cold War and it supposedly watching for in-coming missiles from you-know-who, the Defence Command put diplomacy to the fore and gave radar updates to children on the progress of Santa from the North Pole. Come down to The Wrygarth on Wednesday, they said, we've something going on. It soon became clear that what was going on was 'The Phil White Show' from Radio Humberside. It's a good job the front car park of our local, The Wrygarth Inn at Great Hatfield, is of a size to back in its travelling studio. I never did ask mine hosts, Ray and Sandra Thompson, if they'd measured it beforehand. Phil White has been travelling the region for nearly a year doing outside broadcasts from out-of-the-way places and fascinating venues. As he maintains, there's always something of interest to fill his week-day 2.5 hour programme. He should know: by Christmas he'll have reached his 250th. On a wet and very cold Wednesday, though, he and his two techies were pleased for the comfort of the Inn - if not for a handy manger, for the heat, the coffee, and the superb desserts Ray laid on as tasters. Ray doesn't merely own the pub, he's a highly qualified chef. Believe me, the Christmas Cheesecake was fought over. I'd been invited to chat about the Torc of Moonlight trilogy, for sale in the pub's shop, and was intent on discussing the background to Celtic water deities still recalled in the folklore of villages in the area, but it started by being a cabaret spot about Did I come here often and why I was on lime & soda, which rather wrong-footed me. Anyway, if you're desperate you can listen to my Six Minutes Of Fame via the BBC iPlayer HERE (starting at 45mins) which will be archived off-line mid-January. I have a feeling, though, that you'll need to be in the UK to listen as it needs a sign-in. Of course, no writer worth their salt would pass up the research opportunity of such an occasion, and before the programme went live to air I collared one of the techies and asked nicely for a tour of the bus. The rear part is a relaxation area, both for Phil and the crew, and to conduct interviews, and is covered in memorabilia collected during the making of past programmes. The studio section, a mini version of those at Radio Humberside's HQ in Hull, is set just behind the driver's seat. As can be imagined, it is a bank of monitors and trailing wires with a single chair and a mixing desk. An aerial at the rear of the bus picks up the wi-fi signal from Phil's microphone, pushes it through the studio set-up, and via the dish on the roof is bounced off a satellite - currently somewhere above South America - to their HQ in Hull to be broadcast. I didn't understand half of it, but found it fascinating to be taken through the process. Will I use it in some future fiction? Never say never - which was why I asked for the tour. 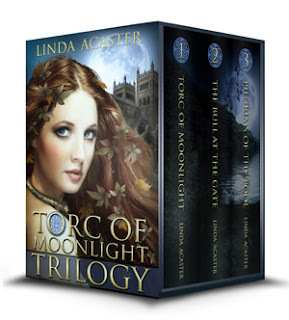 The Torc of Moonlight Trilogy launches today! Yay! And just in time to snuggle down over the Christmas break and immerse yourself in 900 pages of time-spanning Fantasy. Is it Fantasy? The characters are clearly fictional, I make no bones about that, but I’m also clear about the settings being real-world places readers can visit. That leaves the un-named deity who, by slow degrees, is determined to resurrect herself, and re-exert her influence over her environment. Now that’s Fantasy, surely? Not quite. Years ago, when I was a back-packing walker, my preferred area was the North York Moors - a place of sweeping vistas, Iron Age hillforts, Roman marching camps and Industrial Age workings – all returned to Nature. It didn’t take me long to realise there were also an awful lot of springs named Lady Well marked on the Ordnance Survey maps I used. At first I accepted that the Lady in question was a nod to Mary, mother of Jesus. 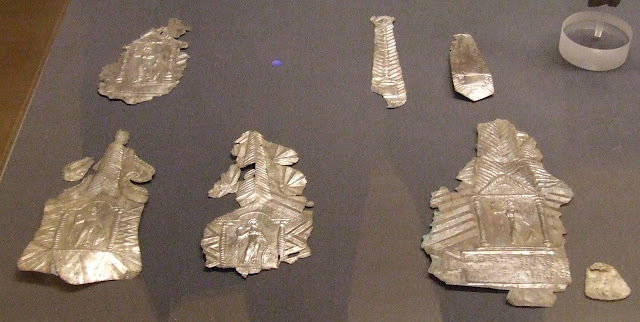 However, with a bit of research it soon became clear that the Lady, or Ladies - each was a resident of her own water source - were linked strongly with Pagan beliefs. They only become an amalgamated, unnamed female entity when conflated during the early Christian period with that other powerful female icon, the Virgin Mary. Perhaps the surprise is not that such occurred during the demonisation of all that was not Christian, but that hardly any had taken on the saint’s name directly, as happened in less wild places. We do know the names of some pre-Christian water deities, mostly thanks to early Roman occupation and writings: Coventina on Hadrian’s Wall in Northumberland; Arnemetia at Buxton Springs in Derbyshire, Senuna at Ashwell in Hertfordshire; and the most famous in the country, Sulis, at Bath in Somerset where she presided over thermal springs prior to the conquest. Even when the invaders tamed the flow of heated waters by building a bath and temple complex in the accepted Roman style, they only partly conflated the known goddess with their own Minerva. To this day she is known as Sulis-Minerva. White Ladies, or a White Lady, pops up all over the country as a folklore memory of a once exalted deity, though they are now often referred to as a ghost. Attending a history day at a nearly village last month, I was intrigued to see mention of a White Lady known to have walked the area of the pond and spring used as the source of drinkable water before the village was connected to modern piped mains. Ghostly apparitions aren’t always known as the more benign White Lady. In another village just north of where I live a short road leading to its village pond is named Bugg Lane. And the native name for a spirit or ghost? Bugg or boggle. It’s where the term bogey-man comes from, originally one of the fey, the people of the Otherworld, it was better not to annoy. In this respect, Jenny Greenteeth gets star billing. Those who were of a superstitious leaning, considered ‘Jenny’ a witch or fairy name. Jenny Greenteeth was, and sometimes still is, associated with deep, dank waters covered in clinging duckweed, of a decaying being intent on pulling the living to their deaths. Rather than it being a true water hag, might she be the last remnants of a remembered guardian of a fresh water spring polluted by man’s unthinking industry? Rather than being demonised, perhaps Jenny Greenteeth, and the other White Ladies, should be an icon for our environmentally-conscious time. If you’ve enjoyed this post, please consider sharing it via the buttons below, or re-Tweeting my pinned Tweet HERE. Many thanks; it's appreciated. While I was constructing the three books of the Torc of Moonlight trilogy into a digital boxed set, I came across mention of Kindle Create, Amazon KDP’s formatting software. I decided to give it a whirl, but not on a three-book boxed set (!). Normally I use my ancient version of Word (2002), but even I can live in the past for only so long and I have recently moved on to LibreOffice5 Writer for its ability to open and work in docx files, and for its associated Calc to read xlsx spreadsheets. So far so good. Would KDP’s dedicated formatting software be a help or a hindrance? Kindle Create is free software dedicated to producing a file (kdf) which can be uploaded via Amazon’s KDP dashboard. The software, launched earlier this year, is acknowledged to be still in “beta” mode, so it is out in the wild to be tested by real-time users like me. Or you. Have a cursory look at it on YouTube. I found it easier to download – for PC or Mac – as it comes with a 27-page easy-to-understand pdf User Guide, and half of that is dedicated to creating a print book, which I wasn’t interested in doing. There is also a plug-in for Word 2010 and above for PC. So what did I think? Mmm. If you’ve never uploaded a file for an ebook, or your idea of formatting a Word document is to use Microsoft’s defaults, then I can see this being of huge benefit. If you are used to formatting a Word document for upload as an ebook, then it tends to be counter-intuitive. For instance, after choosing a Theme – there are several – the software requires that chapter headings to be included in the Table of Contents are identified, whereas normally this is one of the final formatting steps. However, just about at every turn there are embedded information icons giving a one-click explanation, and used in conjunction with the User Guide it is all easy enough. So although it seemed a bit clunky to begin with, the workflow was well thought out. The software also has some interesting touches: for example, a dropped capital at the start of a chapter is available by ticking a box. As expected, just about every element can be adjusted, from the spacing before and after headings, to paragraph indents, to font sizing and beyond – everything word processing software offers. For me, though, the huge plus was being able to preview the partially completed file on tablet, e-reader and phone, whereas previously this was only available when in the middle of uploading the file on the KDP website. Will I be using Kindle Create? Mmm. Not at the moment. I’m too attached to my own formatting system direct in my word processing software. Also, Kindle Create didn’t do what I expected: place a guide item to the Table of Contents page for use with my old Kindle-with-keyboard. Yes, I still use it because it is light and remains highly serviceable, but it doesn’t read an NCX Table of Contents the way the newer e-readers and Kindle-for-PC/Mac do. I can live with that. What I can't live with is the inability to download the mobi file for checking on my e-reader partway through the publishing process on the KDP site, which I can when uploading a doc, docx or html file. That's my last line of checking prior to it being available to purchase. And I appreciate it.